Quick, healthy, and delicious. 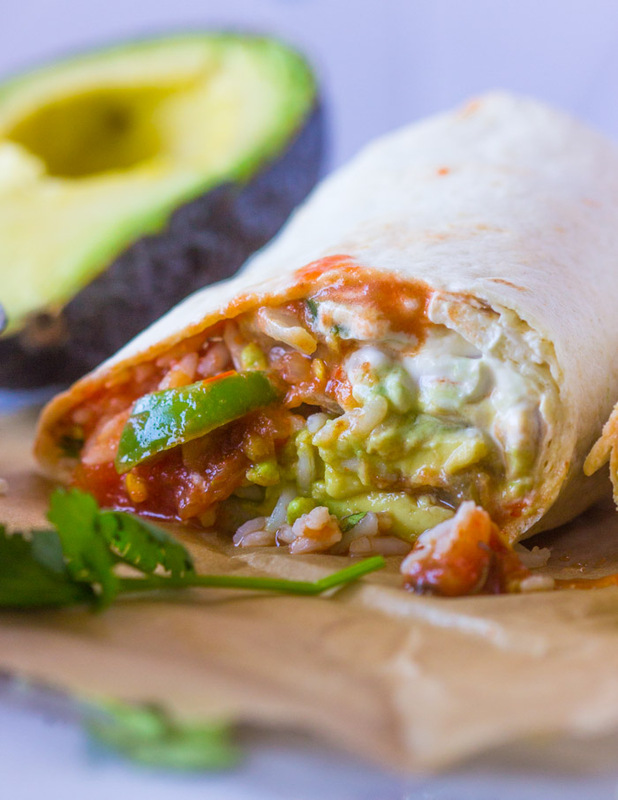 Veggie burritos filled with Fajita veggies, rice, beans, avocado, sour-cream and salsa. Mexican food is currently my favorite cuisine and has been for about 2 years now. 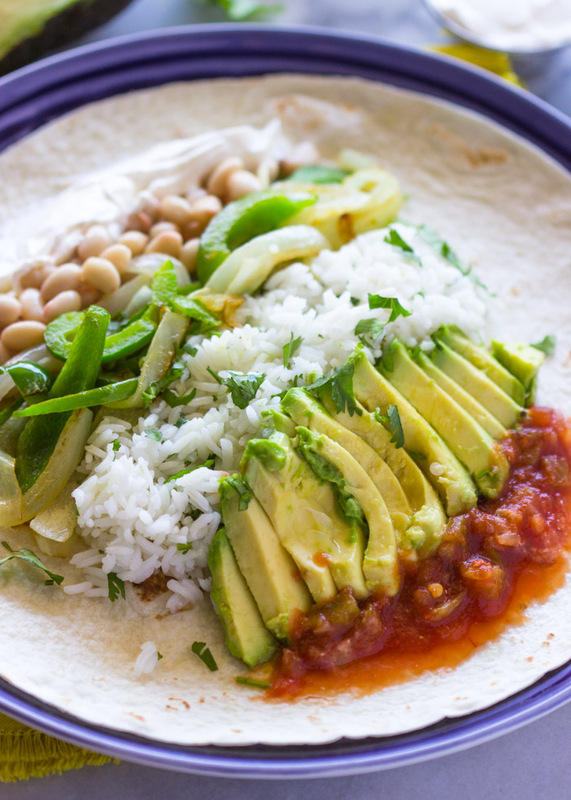 I’m currently loving it because it’s healthy, spicy, and almost always easy to prepare. Plus, if I’m not mistaken, it’s the only cuisine that I actually makes beans taste yummy. If you’re new on the blog you might want to snoop around my collection of Mexican recipes and you will see what I mean. 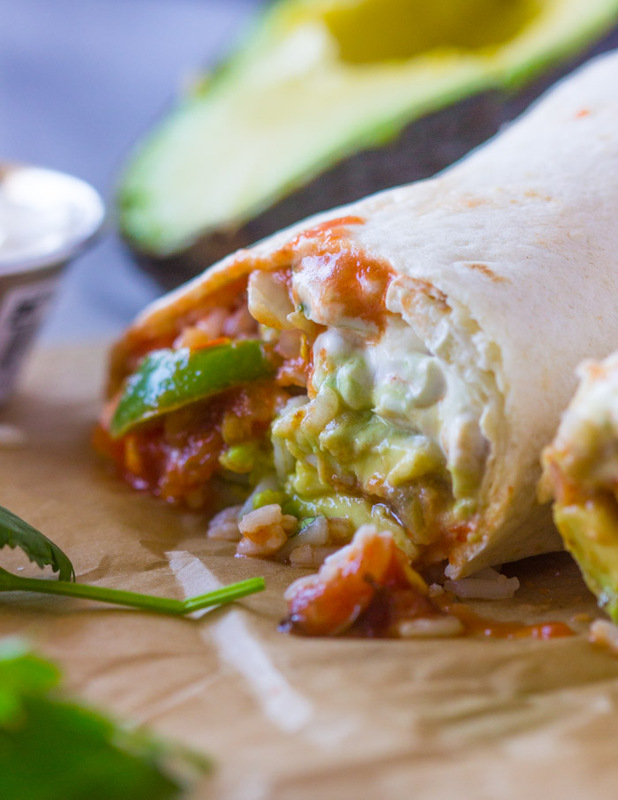 If you liked my chicken and burrito wraps, you’re going to love these veggie burritos. 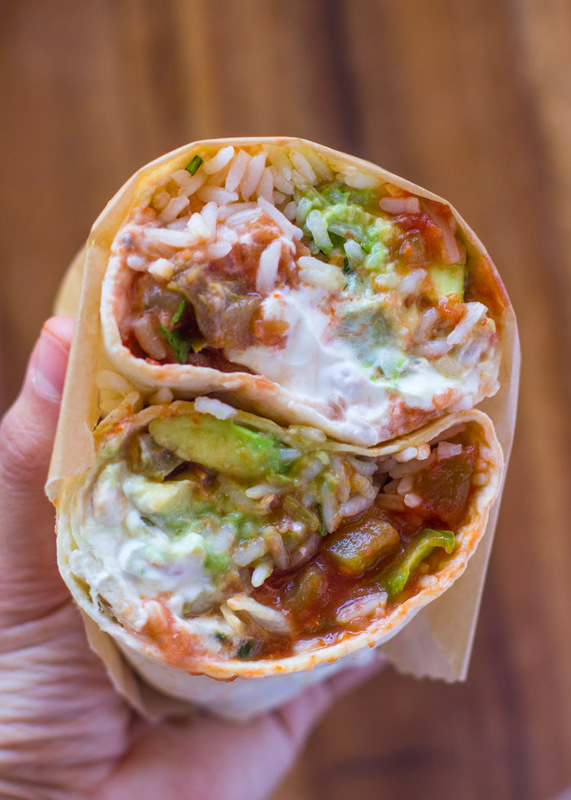 They are packed with veggies, rice, and creamy sour-cream + salsa. They are pretty easy to prepare and will fill for hours! Begin by cooking the rice. You can use any kind of rice you have on hand but I like to use my favorite cilantro lime. 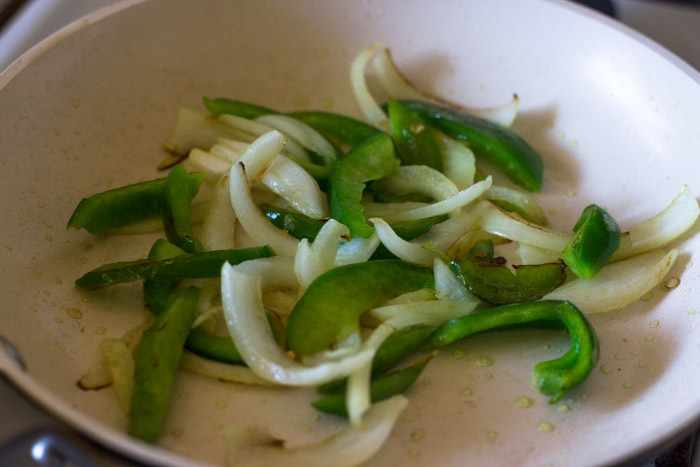 While the rice is cooking, cook down onions and bell peppers in a teaspoon of olive oil just until they begin to brown on the edges. 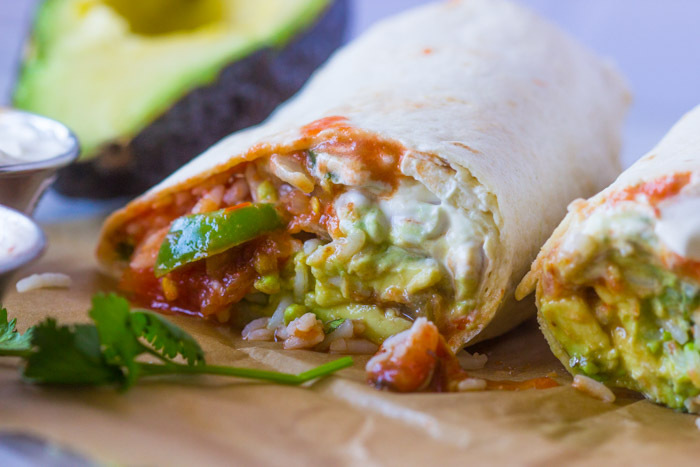 Place the fajita veggies on a flour tortilla along with beans, rice, guacamole, sour-cream and salsa. Wrap tightly in foil, cut in half and enjoy! Begin by cooking down the rice. You can use any type of rice you have ready on hand or use my cilantro lime rice recipe. While the rice is cooking, heat a small pan to high heat. Add the olive oil, onions, and bell peppers. Cook on high for 3-4 minutes or until the veggies begin to brown on the edges. Turn off heat and set pan aside. Lay a flour tortilla on a flat surface. 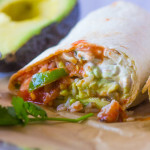 Top with half of the fajita veggies, 1/2 sliced avocado, 1/4 cup beans, 2 tablespoons sour-cream, 1 tablespoon salsa, and a sprinkle of salt and pepper. Fold in the sides of the tortilla over the filling and roll up to completely enclose. Wrap in foil and cut in half. Serve warm. Enjoy! Really good! You can add other veGetables to make it more flavorful and nutritioS like Asparagus. Substituting the rice (or just aDding) for a Taco meat also adds some protein and flavor. I used a mexican rice because i didn’t have cilantro lime ricE and it tasted great! Great healthy dinner! I wonder how well these would freeze, has anyone tried that yet? Also, if you’re looking for something to replace sour cream, try a plain yogurt that has a lot of tartness, like a good greek yogurt, or just one that doesn’t have too much sugar in it. First, I’d like to start by saying I’m really enjoying your blog, but have noticed a common theme that I feel needs to be addressed. This is not Mexican food, this is what is commonly referred to Tex-Mex, or Americanized Mexican food. Fajitas are not eaten in Mexico, it’s a Texan creation. I know this because: 1.I’m from Texas and 2.My family is from Mexico 3. I was born and raised in a city that borders Mexico. Trips were almost as frequent as trips to the grocery store. Anyway, thet are both amazing, flavorful cuisines, but they are very different. I just want readers to understand that what they are eating will not closely resemble authentic Mexican cooking. Also, a good majority of what we make is going to include some sort of (re)frying. If you’re having rice(specifically the orange looking one) with your meal you’re getting a lot of sodium and a lot of oil. This is something I would never make with rice because it is way too high in carbs. If you don’t own a car and walk everywhere, might be a different story. But since diabetes is beginning to take over ALL of the world, rice wold be a good thing to start cutting back on in my opinion.